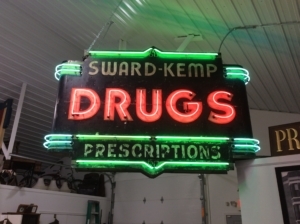 To some it’s just the name of a nice town but to others, it’s home and our home has a vast history that does not take a history buff to appreciate. 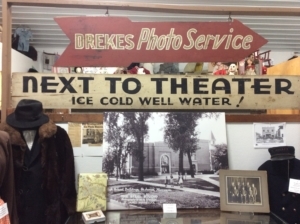 Recently, I paid a visit to the Watonwan County Historical Society here in Saint James. This is a fascinating place that takes you back to an era that seems so distant from the one we are in now. I imagine what life would have been like when technology was advancing and train travel was considered glamorous and new, in the middle of all that excitement was Saint James. Through all the different displays and items that are put together from the city dating back to the 1870’s, I almost felt the energy of a younger Saint James. So much thought and time goes into everything at the Historical Society which makes visiting very enjoyable. Just the amount of items that have been donated throughout the years (and still continuing) is amazing. I visited with Pam Sandbo, the museum coordinator. She has a wealth of information about St. James and put together “5 Firsts” that I definitely didn’t know about Saint James, which are very interesting. 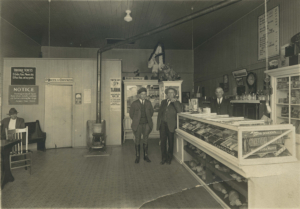 So, whether you are visiting St. James or have lived here your whole life, make sure to stop by the Historical Society! The museum is open on every Wednesday from 1 p.m. – 4 p.m. April through October, and every third Wednesday of the month (1-4 also) November through March. Or you can call and set up an appointment. You won’t regret it, in fact, you will leave with some appreciation and respect for this beautiful town. 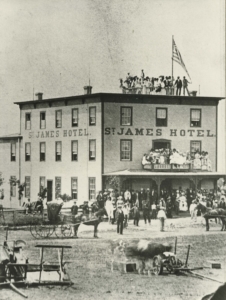 Construction on the St. James Hotel was started in October 1870. 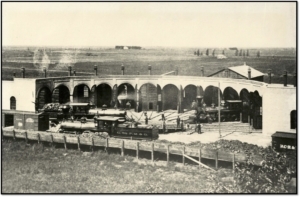 The first passenger train arrived shortly after on November 22 carrying railroad officials on an excursion. They dined at the hotel and then returned to St. Paul. The hotel was later purchased by W. W. Gibbs, operating as the Gibbs Hotel, with an expansion to First Avenue South added in 1890. The name was later changed to the Boston Hotel. This hotel stood south of the post office and is currently a parking lot. 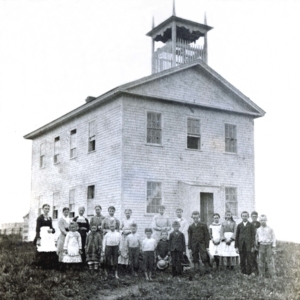 The first school was a two-story building constructed in October 1871 at a cost of $2000. The room on the lower level served as a grade school with the second-story room being furnished later for a “high” school. It was located on the south side of 6th Avenue South between 1st & 2nd Streets facing north. The bell was purchased in 1872 with funds raised by a home talent play “Cinderella.” This same bell was placed on the first high school building in 1889. It was in the bell tower at the old high school and was later torn out and mounted outdoors at the north side of the school. When the concrete foundation started to crumble it was taken out and then stored in a storage room in the school but now will be on display in front of the Armstrong School next year. What?!? The same bell from 1872..that is incredible! St. James was a major stopping point and was the railroad division point between St. Paul & Sioux City. A roundhouse, built around a turntable, was constructed here to maintain the engines. The first six stalls on the left were built in 1873, with the right 8 stalls added in 1880. It was located north of the railroad tracks near the present S-T Industries. The Roundhouse was razed in 1950’s and the Railroad Division Office closed in 1958. The very last passenger train through St. James was on October 24, 1959. Cars were becoming more affordable and Semi-trucks became a more popular means of transporting goods. 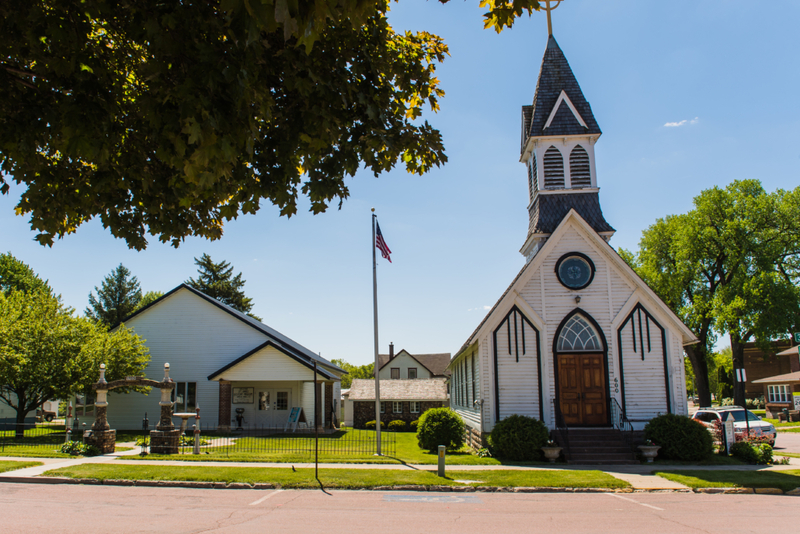 The early Baptist Congregation first met in a railroad car, a passenger coach set off on a side track every Saturday evening and left there on Sunday. That would have been quite the place to hold a service. 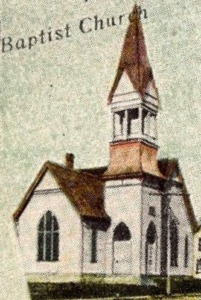 The Baptist Church was built in 1871 on the west side of Armstrong Boulevard South between 2nd & 3rd Streets. This is currently a parking lot east of the Methodist Church. Bishop & Thompson, owned by L. H. Bishop & George S. Thompson, was already in business dealing in general merchandise during the first winter in St. James from 1870-1871. An 1873 ad in the St. James Herald boasts special bargains on dry goods, groceries, crockery, glassware, boots, shoes, hats, caps, ready-made clothing, and notions. Written by Sheenah Buck on behalf of the St. James Area Convention and Visitors Bureau.